From Hallmark by Andrew Brownsword Forever Friends Collection. 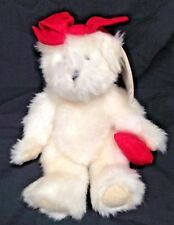 Hallmark White Polar Bear Red Rose Ribbon Bow Plush Sitting 8"
So s ma ll a nd s we et. P ac ka ge t in ge d fr om a ge b ut n ev er r em ov ed. HALLMARK WHITE VALENTINE BEAR WITH BIG RED HEART PLEADING FOR A HUG - SPEAKS, BLUSHES, SHAKES IF HUGGED TOO TIGHTLY (ALSO COMPLAINS). LIKE NEW - CLEAN, NO SMELL. APPROX. 15" TALL STANDING. FROM PET-FREE, SMOKE-FREE HOME. I COMBINE SHIP. “Until WE HUG Again” Pink Rabbit from Hallmark. This cutie will record and replay your voice. It replays with every hug! Your loved one will hear your voice with every hug! Great for an Easter gift! Description: vintage “Crayola” bear. T-shirt is removable. All plush, plastic eyes. Made by Graphics International Inc. Made in Korea Date: 1986 Size: 7 inches Color: red, black Material: fabric, fiberfill, plastic In excellent condition from a smoke free home! See pictures for details. Feel free to contact me with any questions. Ships within 24 hours! This pair hold hand and have magnetic noses. The boy is purple and the girl is pink. LOVE & KISS KISS BEARS. Lots of pictures to show condition. Hallmark Pink Bear Plush with Pink Bow Stuffed Animal Toy Baby Girl. Condition is Used, very good condition with no damage or stains. Please see photos for details. Shipped with USPS First Class Package (2 to 3 business days). Ships from a smoke free and pet free environment. 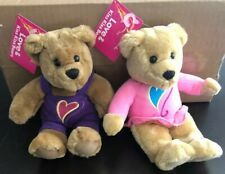 A set of plush stuffed teddy bears, Sweet Heart Teddy by Hallmark Cards. These are 9" long, have Velcro paw to hold hands, magnetic mouth to kiss, and the girl bears cheeks light up. Each wear attached outfits in red and white. You can't see them in the picture, but he has cute little black eyes. This bear wasn't played with, but only used for display. Plush Planetary Bouquet. Bouquet is wrapped in black crepe paper and black paper with gold and silver specks with a grey bow. Bouquet of 10 tiny celestial objects in a beautiful wrap, ready for gifting. The Blushing Bear. I clean and test all toys to make sure they work satisfactorily. - shows wear. Very Good Condition. - shows use and will more than likely be flawed. - used but appears to have not been used. Sales policy - IMPORTANT - Read before committing to buy. Vtg Hallmark Bear Love and Kiss Kiss Purple Valentine's Day Heart Overall Plush. Condition is New. Shipped with USPS First Class Package. 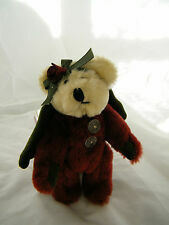 Up for sale are 2 Hallmark KISS KISS Magnetic Nosed Plush Kissing Bears, each standing 9" Tall. From United StatesBrand: HallmarkSize: 10in. NEW Light Yellow Ribbon Fabric Hallmark 6 rolls 4 yards/roll 7/8"
7/8" wide. Each roll has 4 yards. PALLET SHELF BOX U-81. If you have a problem with your item or feel that you can not provide. Our goal is to provide you with a Superior Product and Excellent Service. USED,LIKE NEW. GOOD CONDITION. I have barbie clothing from 1960's to early 1990's listed as I go through my collection. Make sure you check out all photos and zoom in so you are aware of exactly what you are buying. From United StatesBrand: HallmarkSize: 14in. White Owen Teddy Bear Plush. The Hallmark Owen Bear in the photos is the actual plush you will receive. HALLMARK Mistletoe Kiss Kiss Bears. Magnetic noses, turning heads, and Velcro paws enable bears to kiss and hold hands! Lightly played with. Kissing Bears. With Magnetic Noses. Love and Kiss. Seated Christmas Teddy. RetiredHALLMARK Plush TYLER BE AR. 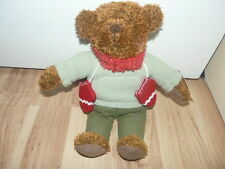 Color: Tan bear with a Red Patch Vest & Red & Green Plaid Bow Tie. Size: 10" tall seated. 70 CATEGORIES for. I list frequently! Item only contains what is shown in photos. Top Rated SellerFrom United StatesBrand: HallmarkSize: 10in. Actual item received may vary sligh tly from the one pictured. Item only contains what is shown in photos. Top Rated SellerFrom United StatesBrand: HallmarkSize: 9in. I have a cat but do not smoke. 0 bidsEnding 28 Apr at 14:40 EDT4d 20hFrom United StatesBrand: HallmarkSize: 9in. Squeeze paw and plays a musical "Jingle Bells". Plays Jingle Bells When Paws Are Squeezed. In Good Condition no. Hallmark Christmas Holiday Elf Puppy Dog Pug Plush Mini 5"
This is a very cute plush toy from Heartline. It is a gray/brown/purple kitty cat with a pink bow. Sold at Hallmark. My son has Asthma & I would never put another child at risk for an attack. Great used condition: Has a light flaw or more than a little piling, wash wear, fading, etc. Style: Teddy Mittens Bear 2002. Fabric: Polyester Fibers, Plastic Pellets. Mistakes happen. I WILL work with you! From United StatesBrand: HallmarkSize: 13in. 2017 Hallmark Teddy Bear White w/ Vampire Bat Soft Plush Stuffed Animal Doll 10"
This teddy bear doll is in like new condition - has no tears, stains nor bad odors. International Ok! Smoke & Pet free! Very Good - 1 or 2 minor flaws, otherwise excellent. Excellent - Very minor signs of previous use. Brand new with tags. Small nick in base wood. Hallmark Stuffed Golden Plush Trevor Teddy Bear With Christmas Tree Sweater 14"